The Berea community is located about six miles northwest of the city of Greenville, South Carolina, at the foot of Paris Mountain. The first people to settle in this area came primarily through the Blue Ridge Mountains from Pennsylvania and other northern states in the early eighteenth century. They were of Scotch-Irish and German descent and were, for the most part, poor and had limited formal education. Prior to 1811 there was no provision in the General Statutes of South Carolina for a free public school organization in the state. In 1811 an act was passed to establish free schools throughout South Carolina. Yet, in the 1800's most South Carolina high schools, colleges, private schools and academies existed primarily to train the student in a professional field. There were very few schools which offered training of a general nature and many of these were established from a religious point of view. This act, which is too lengthy for inclusion here, provided the organization of the free schools. It did provide three hundred dollars annually to be paid from the state treasury for the maintenance of each school and stipulated that reading, writing and arithmetic would always be taught as directed by the commissioners. 1. A poll tax of one dollar to be used exclusively for the public schools. 2. All public schools to be exempt from taxation. 3. Schools to be kept open six months of the year. 4. Compulsory attendance for ages six to sixteen. The first free public school in the Berea area was built under the legislative enactments of 1811 and 1868. The school district was located in Parris Mountain Township. . .
Because people in the community had little formal education and spent most of their time on the farm, they had very little interest in school affairs. Most of the people did not have a job other than farming and some of the students went to school until they were seventeen or eighteen even though the school went only to the seventh or eighth grade. This school, the Saluda or Davis school, combined with the Forestville school and was known as Armstrong, located in the Armstrong Community on Keeler's Bridge Road. Armstrong sent students to Berea High as part of the freshman class in later years. Armstrong, although moved from its location on Keeler's Bridge Road, still sends students to the Berea Middle & Senior High schools today. 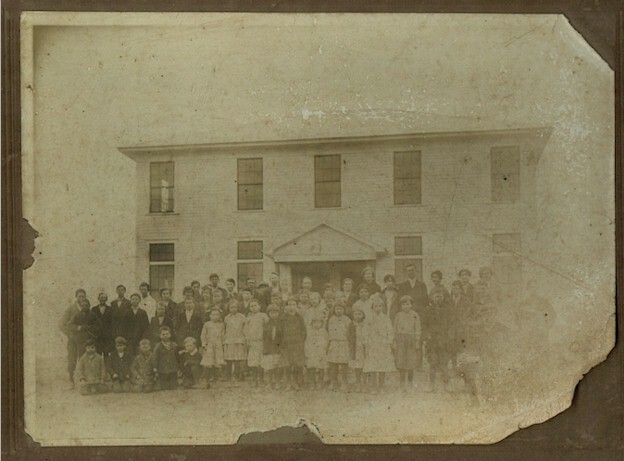 Photograph was taken in November 1916, one month before the school was lost to fire. Both the Deed Books in the Greenville County Court House and the memory of elderly residents of Berea confirmed that the land for the first school to be named Berea was secured in 1885. Why was the school named Berea? Evidently, it was from this Biblical passage that the community and church name was chosen. Since the church was formed before the first known school, it is assumed that the school simply used the name of the church and community. In 1900 Berea is listed in the annual report of the State Superintendent of Education as having one teacher, sixty-eight pupils and a school session lasting twenty-four weeks. Mr. W. P. Cunningham was chairman of the Board of Trustees and the annual budget for the school was $355.72. The students studied spelling, reading, mental arithmetic, written arithmetic, geography, history, and science. The school was able to operate a little longer than the regular term (under law at this time, terms could be set by the local trustees) by the payment of tuition fees.17 (1900 Annual Report of the State Superintendent of Education, p. 101) The Berea School was under the direction of three trustees until 1951 when the schools of Greenville County consolidated into one district. In 1906 the Berea School established her first library with one hundred forty volumes. The library was established under "An Act to encourage the establishment of libraries in public school of the rural districts" which was passed in 1904. 18 (1905 Annual Report of the State Superintendent of Education, p. 23) Under this act the patrons and friends of a free public school established a library by paying ten dollars for this purpose. The school district also paid ten dollars. After establishing the library the trustees of each district had the duty of selecting books from an approved list drawn up by the State Department of Education. In the South Carolina constitution of 1895, a three mill tax was imposed to be applied to schools in each county. Each district could also levy a special tax to apply to its schools; however, this tax could not exceed four mills. Very few schools had levied this tax by 1906 although Berea, along with other schools, did use this special tax for financing the school in later years. In the annual report of the State Superintendent of Education in 1906, the following taxes were used for support of free public schools in the state: the three mill tax, special tax, dispensary fund, poll and dog tax. Rural schools were extremely hard pressed for money and in later years special appropriations were made to ease this burden.17 (p. 183) . In the first few years of the 1900's there was much criticism of the South Carolina education system. Prior to this time there was very little legislation governing the policy and procedures to be used by the state schools. The legislation in 1811 and the Constitution of 1868 were of utmost importance to the field of education, but were insufficient to meet the needs of the schools of South Carolina. 2. Two mills special levy for high school purposes authorized, upon election of qualified voters. However, the schools were still not meeting the needs of its students. The following criticism comes from a study submitted by Mr. W. H. Hand under the provision of the new high school act to make an appraisal of conditions of the school system of South Carolina in 1909. 1895 and is collected by the counties on its own property. Some counties do not return its taxable property justly, while other counties return it as one fourth of its real value. The second reason for a poor school system is low teacher's salaries. The average salary for teachers in 1908 was $267.00 a year, or $45.87 a month. Also, the teachers were incompetent, some having finished the course of the common school, passed an examination by the local Board of Trustees on question[s] prepared by the State Board, and taught students who, in some cases were more advanced than she. Also, a teacher's certificate was easily had, sometime passed out as a favor, and often time during the examination the room was open to discussion by all persons taking the test as to the best answer to a particular question. Many of the rural schools would attend only 110 days whereas the state required 180. The reason for this was lack of school funds, some of the rural schools had to run the school on $300.00 and when the money ran out, they had to close down. Another reason for a short school term was that money had to be held over to staff the school the following year until the tax collection time. Some of the other reasons why South Carolina had a faltering educational system were: poor schoolhouses and poor equipment; too many little half supported schools; neighborhood jealousies and quarrels; inadequate supervision; constant change of teachers; the course of study; and poor attendance.19(William Harvey Hand, "Our Schools," Bulletin of the University of South Carolina, Nov. 16, 1909) . It was shortly after the High School Act in 1907 passed that Berea applied for accreditation as a high school. In 1911 Berea met the requirements as a Class "E" rural high school as stipulated under the High School Act of 1907. In the Annual Report to the Superintendent of Education, schools were classified as A, C, D, and E. An "E" classification was a school which offered a three year curriculum [and making not fewer than ten standard units of credit], had two teachers who gave all their time to high school instruction, had a recitation period of forty minutes and a school year of not less than thirty-two weeks.20 (Annual Report, p.36, Report 1912) According to Mrs. D. B. Hunt (Berea resident) students had to be asked to come and make the necessary number for a high school in order for Berea to qualify. When Berea received accreditation as a high school another room was added to the school making a total of three classrooms of wooden structure and a supper was held in celebration of the occasion.7 At this time the school encompassed grades one through ten with grades eight (sixteen students), nine (four students), and ten (five students) being the secondary school. Mr. I. R. Barton was the first principal of the high school. English , Latin, United States history, math, and science comprised the curriculum. 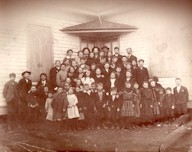 In 1913, Berea and the Saluda or "Davis" School combined. In this consolidation, some of the students came to Berea while others went to Armstrong. This consolidation occurred under the provisions of the Nicholson Act of 1912 which encouraged consolidation of small school districts and the establishment of larger schools. After 1913, Berea was not listed as a High School since according to the Annual Report of the State Superintendent, there were not enough pupils, enough teachers, enough interest, enough money, and not enough cooperation. In 1916, the total revenue for the school was $1,362.90 and the school property was worth $235.00.21 (Annual Report, p. 189, Report 1914) . .The new school was a two story building with four classrooms downstairs, two upstairs and an auditorium on the second floor that could seat two hundred students. Since there were no desks, students sat on benches. Water was supplied by a well which remained in operation until 1957 when the district received city water. The school was heated by a stove in each room. "You would be blistered on one side and frozen on the other." (Mrs. Amy Redfern, Greenville Newsinterview October 18, 1989) A school cafeteria didn't exist. The students brought lunches in sacks or tin pails. Usually this was left overs from breakfast. Sausage biscuits and baked sweet potatoes with well water were popular lunches. This school, with the addition of more land and an auditorium and gymnasium, served the school until 1940 when under the Works Progress Administration it was torn down and a new building erected. Shortly after the school was moved, two legislative acts affected Berea in its development. In 1919, the Term Extension Act was passed which encouraged rural schools to stay open longer during the year. In 1924 the 6-0-1 Act came into being. This Act stipulated that the state would pay for six months of school if the district would pay for one additional month of instruction. 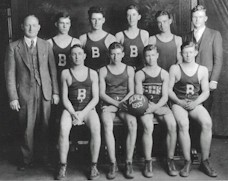 In 1924 Berea started her first basketball team. Team uniforms were brown khaki shorts and white tee shirts with single green stripe. 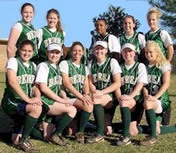 Since that time Berea teams have worn the colors of green and white.23 (Personal Interview, Mr. Tom Jones, March 27, 1966) [Colors altered to green, gold, and white by school vote in 1983] In 1927 the girl's team was organized. Their uniform consisted of large black bloomers which extend[ed] below the knees, and white middy blouses.24 (Martha Huff, "Sports," The Berean, October 1, 1935, Vol. I, p.6.) In 1928 the school bought the first green and white basketball uniforms for both teams.. In 1924 Berea was listed as a first year high school in the Annual Report of the Superintendent of Education. Under the revised High School Law, in order to award a state high school diploma, a school was required to offer a four-year course (grades eight, nine, ten, and eleven) and sixteen units of work with a term of one hundred and eighty days. A school could not award a state diploma until four years after its acceptance as a high school. 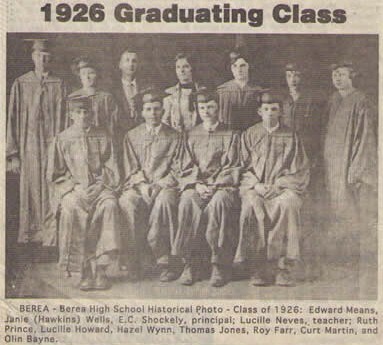 Thus Berea awarded its first high school diplomas to its 1927 graduating students. Up to this time the students were awarded a certificate. Once state diplomas were awarded Berea was renamed "Berea State High School.". In the late 1920's a few students from Vineland, a school located in Pickens County, attended Berea. Vineland students continued to attend Berea until the early 1940's when they began to attend the Dacusville School (Pickens County). In 1927 Berea received students from the Armstrong School as part of the 1927 freshman class. These students were transported by a truck until 1928 when they were transported by a privately owned bus. Also in 1927, the first course in agriculture was offered under the direction of Mr. Hugh Brown. 26 (Interview, Mr. J. H. Barnett, April 18, 1966, Superintendent of Berea School District, 1928-1932) The inclusion of the course in the curriculum was a result of the Smith-Hughes Act of 1917 which allocated special funds for the teaching of vocational courses in high school. At the start of this program Mr. Brown divided his time between Berea and Dacusville. Later, home economics was to be offered because of the Smith-Hughes Act. In 1928 the first debate team was organized. In later years this team won many awards for the school. Also, music was added to the curriculum and dramatics was made a part of the extra curricular offerings.
. In 1930 a new auditorium was added to the school and in the same year a gymnasium was constructed behind the auditorium. 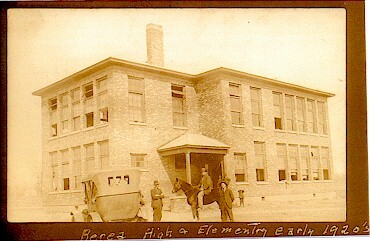 According to Mr. Barnett, Superintendent, Berea's was the first indoor gymnasium in the schools of Greenville County. It was patterned after the gymnasium in Gray Court-Owings High School, Gray Court, South Carolina. The partition between the auditorium stage and the gymnasium was moveable and for athletic events spectators would sit on the stage of the auditorium to watch the games. 26 Bonds were floated for the construction of these two buildings.
. Lovers of basketball have paced and jammed the Berea gym often, but have never seen the local team defeated on the home court. .The record of the last four years follows: . In 1930, Berea was not listed in the Annual Report of the State Superintendent of Education as a high school. That year Berea offered only a three-year course and did not meet the minimum requirements of a four year course and sixteen units as outlined by the revised High School Law.29 (Annual Report, p. 9, Report 1930) In 1931 it was listed again as a high school and offered a diploma. French and trigonometry were added to the curriculum at this time. The school often was the center for meetings of community groups at night and after school it was frequently open for recreation in the afternoons. It was not uncommon for the school to provide entertainment for the community. Plays, contests, usually of an agricultural nature, fairs, and athletics provided most of the entertainment.26 In October, 1935 the Parent Teacher Association sponsored a community fair on the school grounds. All of the grammar grades in the school [district] submitted projects, and the high school students submitted the school paper. The paper was called the Berean and was sponsored by Miss Vara Neves. In publication since that time the name was changed in 1963 to The Berea Times. This was the time, too, when the school had a "lay-by" summer school. Under this arrangement school was dismissed in early May for plowing, started back about mid-July until September, stopped for harvest of the crops, and started back the day after Thanksgiving. According to Dr. Sanders, Principal of Berea from 1936-1938, the school was doing an effective job in meeting individual needs. Ten to fifteen per cent of the students went successfully to college. Students could pursue either business, vocational, or college preparatory courses. 31 .
story building was torn down and a new building was erected in its place. As a part of the 1939 building, a cannery was constructed on the school grounds and was operated as part of the community program for adults. The purpose of the cannery was to enable farm people to can their food at a reasonable price and in less time than home canning and it frequently operated well into the night. A potato house was also built to enable people of the community to cure their sweet potatoes. Both the potato house and the cannery were built with Works Progress Administration labor. By the 1960's the potato house had to be used as a classroom due to crowded conditions. The curriculum in 1940 was largely college preparatory according to A. W. Hawkins, Superintendent of the District. Trustees, teachers and residents of the community co-operated to improve the educational program. The curriculum was also enriched to meet the needs of boys and girls. Along with the usual scholastic subjects, the school offered agriculture, shop, home economics and commercial work. The teachers, although they did not have job security, were well qualified. From a faculty of eight, four had Master's degrees. 1940 marked the first year the seniors went to Washington and also the first yearbook. That annual was called the Berea Hi-Lights. It was not published again until 1953 when the name was changed to The Beacon. However, people began to move into the Berea area and school enrollment increased. The Berea community began to change from rural to suburban in the early 1950's. The G. I. Bill and Federal Housing Acts helped stimulate the growth in the area. The people of Berea were no longer farmers. While many of them still had a few acres for a garden, their primary jobs were found in the city of Greenville. In 1951 Greenville County Schools were changing and growing and it was determined that the best organization of the schools would be that of a county unit system. As a result of consolidation, the individual trustees of the Berea School District was dissolved but were used from time to time in an advisory capacity by the County Board. Many of the people of the community did not approve of consolidation. The school had played an important part in the life of the people; it had been well organized and administered. Under the direction of three trustees, in 1940 the school was one of the most modern in Greenville County; and due to consolidation the school would be operated by a Board of Trustees that was not of the Berea Community. The people of the community were apprehensive that they would not have voice in the education of their children. In 1952 the McCrary Company installed underground pipe for steam heat to the auditorium and gym. This came after a fire had destroyed the inside of the auditorium due to a defective flu. 1953 was the year when the Beacon, the Berea annual, received its permanent name. "During the 1952-53 school year there was a school wide competition for naming the school's yearbook. The name the Beacon was the idea of 8th grader, Tommy Edwards (Class of 1957), who noticed that there were two sets of AM radio towers in the Berea community and they were beacons ." (Billie Burdine [Hogg], first Beacon editor - Interview June 7, 200245) In 1954 Berea began experiencing rapid growth in student population. In 1954, when city water was installed in the area, Berea's crowded conditions became acute. The following is reported by Engelhardt, Engelhardt, and Leggett, Consultants of New York. The fourth Berea High School was opened in September, 1962. The school cost $1,300,000. It was located between Berea Drive and Burdine Street on thirty-three acres of land which were purchased at approximately $1,000 per acre. The school was planned for 750 students in grades seven to twelve. When opened, this modern, new school had such innovations as carpet in the library, in one corridor [100 wing hallway], and in one classroom. Also the walls, separating the corridor from the classroom [and between the individual classrooms] did not extend to the ceiling but had an eighteen inch open area. The school which separated from the elementary school for the first time in 1962 was then known as Berea Junior andSenior High School. During this year, Berea High School fielded its first football team. The stadium was later named "Bulldog" stadium by Mr. John Duckworth, civic leader of the community.41 (Interview, Coach John Liston, May 18, 1966)[*Lloyd Voyles Fuman University master's thesis end] The school name changed officially to Berea High School when the new Berea Middle School opened January 1973. Additional expansions and renovations were conducted as the school's population swiftly grew. In 1971 seventeen classrooms were built (200 Wing) and the library expanded incorporating four classrooms in anticipation of the district wide racial integration of all schools (1972). By 1977 the old belching black-smoke coal fired furnace was retired, though the towering coal silo remained behind the school until the late 1990s. In 1983 school colors were officially updated to green, white, & gold by a student and faculty school vote. "In the 1960s gold trim was used for both our football and basketball team uniforms. "(Jim Mattos, 4/18/2006) The Berea High student body once again suddenly increased with the closing of Parker High School in 1985 with most of that school's student body being divided between Berea, Carolina and Greenville High School. 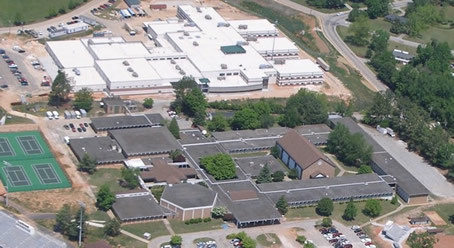 In 1988 with the school's population over 1100 students, came additional renovations which included school-wide air conditioning, ten new classrooms, new media center, a "commons" building, and enlarging the administrative facilities, fine arts wing, athletic facilities, and cafeteria area. The 1990's was a time of expanding educational technologies. The Berea High Media Center's technology plan was instrumental in the school's electronic media development and was influential in the district's rapid academic technology growth. In 1989 wiring for networked computer use was completed between administrative offices and the Media Center. By January, 1990 the Berea Media Center had acquired the district's first library computer server (a "powerful" 386/33MHz CPU). In the 1992-93 school year, Berea High added the school district's first multi-media CD-ROM towers to its server to enhance electronic materials access. During the same year the Media Center's old library card catalog was electronically automated. In 1996 the school's classrooms were wired with local funding and volunteer labor provided by ITCDeltaCom for networked CD-ROM software and Internet access. 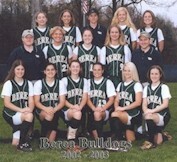 Berea High joined the world wide web with its own Web pages in the 1997-1998 school year. By the 1999-2000 school year, Berea High's use of remote Internet subscription services became a model for the district and was recognized in the state for it's advanced use of educational technologies. On January 17, 1997, the Berea High School gymnasium was officially named the "James G. Mattos Gymnasium". "Jim" Mattos served Berea High School as an educator, yearbook advisor, and coach from 1957-1984. Coach Mattos led his teams to seven conference basketball championships, nine track, three cross country, and five back-to-back Greenville County track championships. He was named Greenville County Teacher of the Year in August 1978 and in October 1978 recognized as the South Carolina State Teacher of the Year. After retiring from public education he served our community for ten years in the South Carolina House of Representatives (1985-1994). Coach Mattos never asked more of those under his tutelage than he was willing to give, whether it was athletics, the classroom or an extra curricular activity. His demanding style and unlimited giving of his time typified his philosophy that high expectations bring outstanding results. Jim Mattos' influence will be felt for generation as as these students become parents and follow his example of excellence. 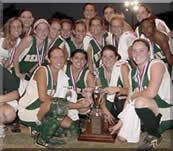 Berea High School won the Class AAA state softball championship May 16, 2003 defeating West Florence High, May 12, 2004 by defeating Brookland-Cayce High School, and May 11, 2005 again defeating Brookland-Cayce High. The following appeared in The Greenville News: . The Greenville County Board of Trustees proposed March, 2003 that a new Berea High School be built at the current location with an expanded 44.4 acre campus at a cost of $29.5 million (Total Project cost - $35.4 million). New construction began May 2004 with completion August 2006. On the evening of August 15, 2006, parents, students, alumni, and community members were invited to view the newly constructed Berea High School. This school's first principal, Mr. William Roach, and his administrative staff had worked feverishly during the entire summer to insure that the facilities would be ready for the occasion. Teachers were allowed into the building in early August while construction continued around them to prepare their classrooms for the opening of school. Students attended for the first time the school on August 17, 2006. New to the school was a student commons area, multiple practice gyms, an athletic weight room, Junior ROTC facilities, yearbook and newspaper staff computer lab, four portable wireless classroom computer labs, telecast production room, new athletic and band practice fields, and a state-of-the-art computer communications network serving all staff members and students. 1920 Thomas G. Goldsmith 1974 Norman Mullins, Ph.D.
1928-32 J. H. Barnett 1997-02 R. Keith East, Ph.D.